A couple of weekends ago a rare event took place, my youngest Son Danny spent a whole day detecting with me and Garry! we set off around half 5 and reached the fields in question at around 9:30 am, Danny slept most of the way down, and who can blame him? the wet motorways hold nothing eye catching whatsoever. The field that we had decided to search had a long track-way leading to the bottom of it which was ideal for us, a 5 minute rough ride in the pick-up saw us park at a lovely place underneath some trees, ideal for an afternoon brew I thought, but we had finds to make first! I kitted Dan up with a Fisher F75 DST with the standard coil on, made sure he was all ready to go, clothing spade, the lot, I fussed around him too much as twice he said “Dad, Im fine, I can manage”! I scrambled my Teknetics G2+ together and within 5 minutes we were away, I kept close to Dan, watching his style, watching his speed, and I was really taken aback, nice and slow sweeps, nothing too eratic, coil could have been a little closer to the ground but all in all I was confident he would do well. I found myself concentrating more on him than my own detecting, and I soon found myself chatting to him , asking him if he was ok and was he picking things up etc, after around 30 minutes i winkled out a small silver coin, milled for sure but thats all I knew, so I placed machine down and asked dan to pick it up and check it out, He examined the coin and said, “I cant believe that these coins are just in here, waiting to be found Dad” He stared at it awhile and read out the date, 1865, which turned out to be a queen Victoria Sixpence, how I wish he had found it, I was willing the Gods to send him something, anything! soon after another signal close by had me unearthing a much earlier coin, this time a worn Roman Duponidus, again I shouted Danny over to show him and told him the age, because it was worn I think he was more impressed with the Victorian coin! Lunch-time came and went, More fussing from me regarding his lunch etc and we were back at it, by this time the weather for October had become Barmy, we were all in T-Shirts! Garry was into the first real find of the day, bringing up a Silver Roman denarius of Tiberius, we all stood around looking at it and admiring the find for 5 minutes or so then back to the grind, nothing of note came my way until around 2:30pm when I managed to winkle out a small, broken Medieval Hammered coin, not long after Dan had his First Roman coin around 20 yards from me, a worn Bronze which was on the surface but I think he was happy with it! Me on the other hand, I was over-joyed!, bringing my son out onto the fields to find ancient things with me has been my ambition for years and years! I congratulated him and told him to stick in, I noticed he was taking too long examining signals, he was almost mesmerised by them, once located , dig them out Son I shouted! Not long after finding the Roman he managed two victorian Pennies, well worn but still welcome for him, He wandered away from me and back to the pick-up for a drink, detecting is hard! especially when he are at it for hours on end and walking miles, I think he was tired, Late nights dont help! At around 4pm I snaked my way across the field to the other end with no particular search pattern, a couple of bits of scrap turned up then I managed to bring up a denarius of my own, another Tiberius coin, this time the tribute penny type, I was tired but happy! 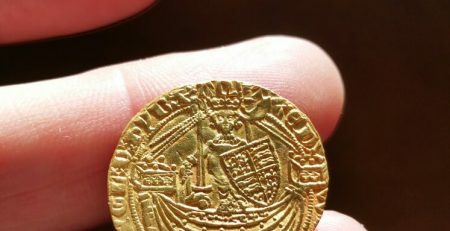 A few yards later another signal had me holding a rather worn and chipped half -Groat of Henry the eighth, it was too late in the day to really stick in up this area of the field but when Im back on it I will certainly give this section a full day. Travelling back home we stopped off at the nearest Fish & Chip shop to fuel ourselves up then we were back on the motorway, a quick glance in the rear view mirror saw me looking at Danny snuggled up asleep in the back, heart-warming to see and really proud of him spending a whole day with his Dad detecting, Lets hope he will come out with us again sometime soon! 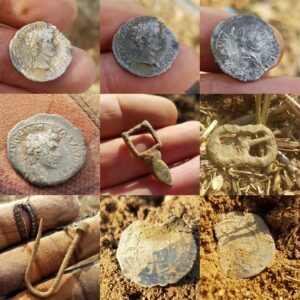 Heat, Stubble & a few Finds! Detecting season has begun! The waiting game is nearly over. Whats new in 2019 with Unearthed uk!